No Branch, No Problem! Thanks to the NCR SelfServ 37! Dramatically expand your physical footprint without maintaining brick and mortar buildings with the NCR SelfServ 37. As an outdoor stand-alone unit, the SelfServ 37 can resist the harshest weather conditions while handling remarkably high transaction volumes. 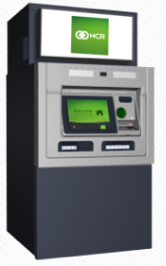 The only fully weatherized ADA certified free-standing walk-up ATM that can perform nearly every teller function at any location! In addition to increasing your brand visibility, the SelfServ 37 features self-healing technology so your ATMs can work around the clock. Plus with FTSI’s industry best uptimes, you can be sure your ATMs will stay in service. SelfServ 37 ATMs can also provide you real-time data on activity levels that you can access remotely. SelfServ 37 ATMs include a multi-layered approach to security and have the highest defense against logical and physical attacks and can even prevent unauthorized code from being installed. Plus you can save a yearly average of $4,000 per ATM in real estate costs and generate a monthly average of $4,100 in deposit driven product sales per ATM.